Tower Grove Park has long been home to several sculptures and statues which are elements of the Park’s historic character and significance. Henry Shaw’s design for the Park includes three bronze statues lining Main Drive down the east-west center road of the Park. They have been in the Park for more than 130 years and honor major figures from three nationalities –English, German and Italian. These nationalities were the primary immigrant groups in St. Louis at the time of the statues’ installation. The statues helped create a welcoming environment for newly arrived residents in the “new country” and St. Louis. The eastern-most of the statues, near the Grand entrance, is of Christopher Columbus and was dedicated in 1886. It is nine feet tall and sits atop a granite base with relief elements on each side. At the time of its installation, this piece had the effect of welcoming the Italian immigrant community into the community and the Park. Americans now know far more about Columbus than we did at the time the statue was installed, and his legacy has led to some controversy in St. Louis and around the country. In recent years the Columbus statue has been vandalized on several occasions, requiring the Park to spend unbudgeted tax dollars and charitable contributions from St. Louisans to do restoration and to ensure public safety. Tower Grove Park is proud of its ongoing commitment to be a prominent place of welcome and diversity for all, as it has been for nearly 150 years. Because questions have been raised about the place of the statue in the Park and to mitigate risk of future damage to the statue, Tower Grove Park has formed the Columbus Statue Commission comprised of community stakeholders to evaluate and make recommendations about the proper role of the statue in the Park. This Statue Commission was announced on August 29, 2018. + What is the Park planning to do with the statue? The Statue Commission will make long-term recommendations to the Tower Grove Park Board of Commissioners. + Will members of the public have an opportunity to give their opinion? The public will have opportunities to express their views for the Columbus Statue Commission’s information and consideration. They will define their own work process and will make known to the public when and how any interested person and group can make their views known. + Who’s on the Columbus Statue Commission? Members of the Statue Commission represent as many stakeholders as possible while still making it feasible to have a productive dialogue and learning experience. Among the members are individuals representing the three Native American communities, the Italian American community, representatives from major St. Louis arts and history institutions, Park users and others. Their role will be to make recommendations about the statue in the best interests of the overall St. Louis community that will continue the Park’s role as welcoming oasis in the city, recognize its history and promote the enjoyment of the Park by a wide range of residents and visitors alike. + What is the timeline for the Statue Commission to make recommendations? The Columbus Statue Commission is made up of citizens who are volunteering their time to do important work for the community (a professional facilitator will guide the member’s work). A schedule for their work has not yet been determined, but the goal is to make recommendations during the fall or early winter. + Who will make decisions about the statue? 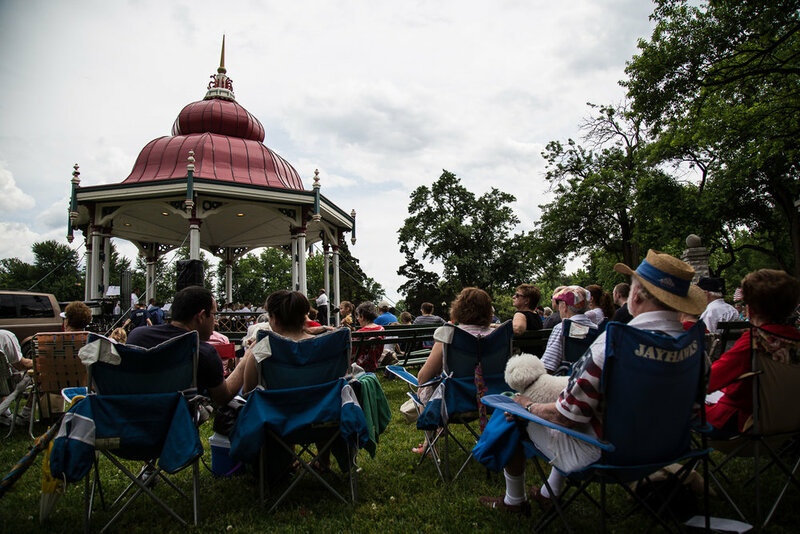 The Tower Grove Park Board of Commissioners has responsibility for management and operation of the Park. It will review the statue advisory commission’s recommendations and make decisions about the role of the statue in the Park. Tower Grove Park has an independent staff employed by the Park’s Board of Commissioners. Approximately 40% of the Park’s current operating budget comes from taxpayers through city general revenue allocations and sales taxes. The remainder raised or earned from philanthropic contributions to the Park from individuals, foundations and corporate donors, and from facility use fees. The land and structures of Tower Grove Park are owned by the City of St. Louis, but the Park is managed and maintained by an independent Board of Commissioners according to terms established by Henry Shaw in 1867. Thank you for your comment. Due to the high volume of submissions, please allow one to two weeks for a response.